Hey everybody! How’s that offseason going? Only six months left before ‘cross season is in full swing. Time to start motivating, right? This Friday, March 11, there is a hella cool event happening in the DC metro area that, if you like bikes and the people that ride the heck out of them, you need to attend. The Bike Doctor of Waldorfis hosting a “Meet The Pros” event with a killer cast. Tim Johnson, Aaron Chase, Tinker Juarez, Hans freakin’ Rey and Eric Carter will all be at the shop answering your questions. Well do I have the perfect opportunity to do just that. And it costs you nothing but a phone call (301.932.9980) or e-mail (bikedrwaldorf@aol.com) to the good people at Bike Doctor to reserve your spot. The event starts at 8 p.m. and you can check out all the details at bikedoctorwaldorf.com. So let’s say hypothetically that you don’t know the professional bike riding people listed a couple paragraphs above. And let’s also say, hypothetically, that this lack of knowledge is causing you to question why you need to go spend an evening socializing with these people. Not a problem. Allow me to introduce them to you. Tim Johnson. Okay, this one should be easy. This is a cyclocross website after all and you could make an argument that Johnson is pretty decent at that discipline. Decent enough to win six U.S. national championships, including three elite, two espoir and one junior. Johnson is also the first rider from the U.S. to stand on a UCI Cyclocross World Championships podium—1999, Poprad, Slovakia. When not tearing it up on the dirt, he rides on the road for UnitedHealthCare presented by Maxxis. Along with his day job as a professional bike racer, Johnson is involved in bicycle advocacy. Just this week he rode down the East Coast from Boston to Washington DC for the National Bike Summit. The ride supported Bikes Belong, which works to increase funding for U.S. bicycle facilities. David “Tinker” Juarez started racing BMX professionally in 1978. Nineteen-seventy-eight! People were dancing disco and wearing white suits, Bernard Hinault was winning his fourth Tour de France and Tinker was racing with the pros. Over thirty years later, disco is dead for a second time, The Badger is zipping up podium jerseys for a living and Tinker … he’s still racing. After making the switch from BMX to MTB in 1986 Juarez has won several national and international disciplines. In 2006, he finished third in the Race Across America Enduro race. Hans Rey was “extreme” when the word was still just a term in a syllogism and “Do the Dew” meant styling your hair. 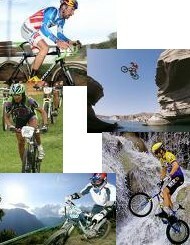 He is a pioneer in mountain bike trials and was inducted in the MTB Hall of Fame in 1999. Although he retired from competition in 1997, he has been traveling the world riding trails as part of the Hans Rey Adventure Team. Rey has appeared on several television shows and appeared in movies such as 1994’s Tread. In 2005, he founded Wheels4Life, a non-profit charity that provides bicycles to people in third world countries. Eric Carter is a former “Old/Mid School” BMX pro who raced from 1983 from 1998. A man worthy of multiple nicknames he blasted onto the scene as The Golden Child and over the next decade and a half transformed into The Earthquake. In 1996 EC (nickname number three) converted fully to MTB racing and is a respected veteran of the scene. So there it is. Killer line-up. And all you need to do is call or e-mail to join the fun. See you there. Previous Previous post: It’s Upgrade Time! Next Next post: Baby Pictures: It’s a Zank!